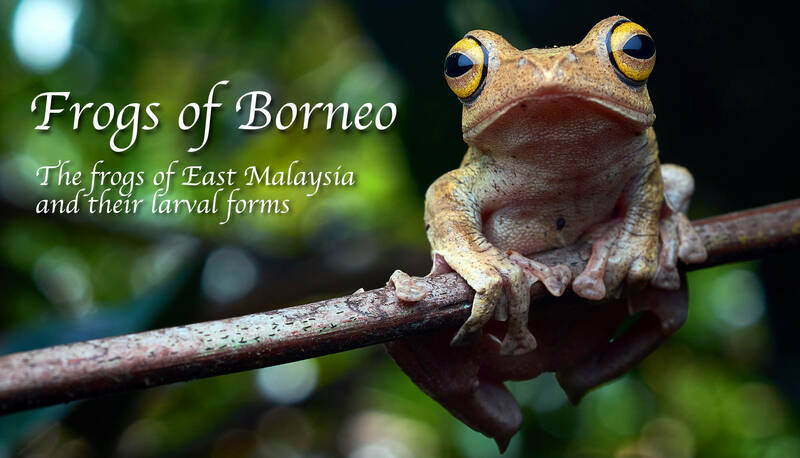 This website is dedicated to the frogs of East Malaysia (Borneo) and their larval forms. It covers more than 100 species, each with an easy to access page, biological information, color image of adult, and many of them with color images of their larval forms. Our mission: Easy access, easy use, unique imagery, and reliable information. We want to serve a broad range of users. We keep it as simple as possible, but provide you with further links and reading suggestions to deepen your knowledge. We like to be in touch with you; send us your field observations! Taxonomy is an active research field. New insights lead to amendments. Species previously considered an evolutionary unit are split up into several species and new species names come into play. This may seem confusing for some, but only documents how little we still know about the true diversity of Bornean frogs. We expect many discoveries in the future. We try to keep track on this site as good as we can, however, we always try to keep the general user in mind. There are dedicated web sites that list the latest on frog taxonomy. In particular, we recommend Amphibian Species of the World as the most comprehensive and most up-to-date source for taxonomic species accounts in amphibians. Use recent versions of Safari, Firefox or Chrome browsers for best results. Use browser's zoom in/out to adjust viewing comfortably. if you have any question or if you can contribute observations or photos, please contact us. This is a creative commons licensed website. Feel free to use the materials presented here for private and non-commercial purposes; respect Copyrights!